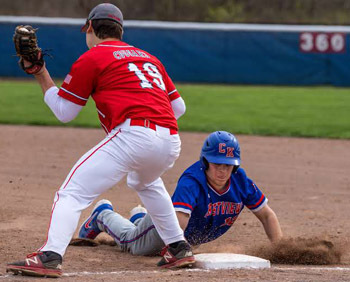 CONVOY — Van Wert dominated Wednesday’s non-conference baseball game against county rival Crestview in just about every way imaginable. Led by Lawson Blackmore, who had three hits and five RBIs, the Cougars piled up 17 hits, while Hayden Maples held the Knights to just three hits and struck out eight in a five inning, 18-2 victory. “Crestview is very well coached, they’re disciplined, very fundamentally sound and always a good program, so it was a good win for us tonight,” Van Wert head coach Charlie Witten said. Already leading 6-2, Van Wert (15-2) scored nine runs in the fourth inning. Blackmore tripled in Nathan Temple before scoring on an RBI single by Parker Conrad. TJ Reynolds walked, then was tripled home by Keaton Brown to increase the lead to 10-2, and Brown scored on a sacrifice fly by Jalen McCracken. 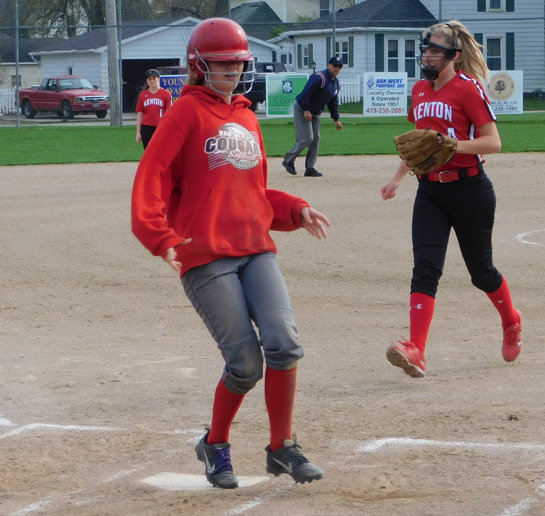 LIMA — Crestview came away with a wild 14-12 softball win against Bath on Wednesday. In addition to 26 runs, including 13 in the sixth inning, the two teams combined for 28 hits. Leading 6-5 entering the sixth, the Lady Knights plated seven runs, including two on a double by Hannah Binnion and three on a home run by Avery McCoy. Binnion and McCoy each had two hits and three RBIs, and Lexi Gregory had three hits and three RBIs, including a solo homer in the first. Codi Miller finished with three hits and an RBI. Kali Small earned the win on the mound. Crestview (13-4) is scheduled to play at Lincolnview today. 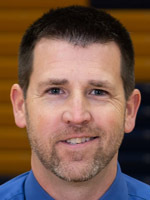 After nine seasons on the job, Lincolnview girls’ basketball coach Dan Williamson has stepped down, but his coaching days may not be over. The Lincolnview Board of Education accepted Williamson’s resignation during Wednesday night’s meeting. Lady Lancers went 8-16 (1-7 NWC) during the 2018-2019 season and during Williamson’s tenure, Lincolnview was 92-117. His best season was 2012-2013, when the team went 18-6 (7-2 NWC). The search for a new girls’ basketball coach is expected to begin immediately. Various field records fell, and Van Wert swept Tuesday’s annual Van Wert County Meet at Van Wert High School. The Cougars tallied 78 team points, followed by Lincolnview (66) and Crestview (25). The Lady Cougars tallied 81 team points, followed by Lincolnview (67) and Crestview (23). Van Wert’s Jill Gemmer set a new county record with a shot put toss of 41-07.50, and teammate Kirsten Clay’s discus throw of 137-05.50 was a new stadium and county record. Lincolnview’s Brad Korte’s 21-08 long jump set a new county record, while Van Wert’s Austin Clay set stadium and county records in the discus and shot put. The Central Michigan University bound senior’s discus throw was 155-03 and his shot put toss was 56-09.75. Caylee Phillips of Van Wert posted first place finishes in the 100 meter dash (13.44) and the 800 meter run (2:35.48), and she was part of the winning 4×200 and 4×400 meter relay teams. Carly Smith, Sierra Shaffer, Payton Money and Phillips won the 4×200 relay with a time of 1:59.57 and Smith, Shaffer, Gracie Gunter and Phillips took the 4×400 relay with a time of 4:35.93. Shaffer also finished first in the 300 meter hurdles (54.73). Teammate Avery Cowan won the 100 meter hurdles (18.49), Elizabeth Tomlinson finished first in the pole vault (6-00), and Jamison Clouse won the long jump (13-07.50). On the boys side, Van Wert’s Jacob Hart (11.19) edged Korte in the 100 meter dash (11.36), but Korte won the 200 meter dash, clocking in at 23.61. Hart was part of the winning 4×200 meter relay team, along with Ethan Brown, Blake Henry and Nathan Jackson (1:34.01). KENTON — Parker Conrad’s first inning grand slam sparked Van Wert to an 11-2 Western Buckeye League baseball win at Kenton on Tuesday. The victory boosted Van Wert’s record to 14-2 (6-1 WBL). The Cougars were up 2-0, when Conrad launched a home run to left field, scoring Hayden Maples, Nathan Temple and Lawson Blackmore. Van Wert ended the seven run inning when TJ Reynolds scored on a passed ball. 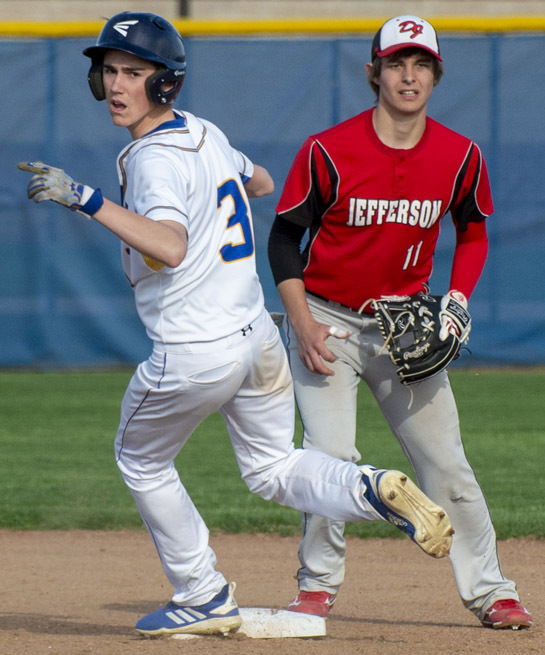 A second inning RBI single by Lawson Blackmore scored Maples, then a fourth inning sacrifice fly by Temple plated Maples, and increased Van Wert’s lead to 9-0. The Wildcats scored a pair of runs in the bottom of the fourth, but Conrad scored on a fifth inning error, then Keaton Brown tacked on the run in the seventh. Maples, Conrad and Blackmore paced Van Wert’s 11 hit attack with two hits apiece, and Conrad finished with four RBIs. On the mound, Owen Treece pitched 6.2 innings and allowed just two hits while striking out seven and walking walk. Conrad pitched the remaining third of an inning and gave up one hit while fanning one. Van Wert will play at Crestview today. On Senior Night at the Van Wert High School tennis courts, the Cougars swept Kenton 5-0. Tuesday’s match was the final home one for Kannen Wannemacher, Michael Hellman and Brendan Browning. At first singles, Wannemacher enjoyed a 6-2, 6-1 win over Kenton’s Landon Rush, and Hellman defeated Hayden Robinson 6-1, 6-2 at third singles. Zane Fast posted a 6-2, 6-1 victory over Taj Chahal at second singles. Van Wert’s first doubles team of Kaden Thomas and Nathan Ruger recorded a 7-6 (11-9), 6-2 win over Rocco Longbrake and Ian Lyons, and the second doubles team of Jace Fast and Nick Carter cruised to a 6-2, 6-2 victory over Cameron Zickafoose and Riley Messenger. Van Wert Elks Lodge 1197 will hold its annual Elks Soccer Shoot on Saturday, May 4. Registration will begin at 9 a.m. at the Elks Lodge, 1197 Elks Drive, and the shoot will start at 9:30 a.m. A parent or guardian must be present during registration. The contest is open to both boys and girls, and they will compete in four age groups: 7 and under; 8 and 9 year olds; 10 and 11 year olds and 12 and 13 year olds. Each contestant will kick 15 shots at the goal. Participants can wear their jerseys or shirts of choice, pants or shorts and appropriate footwear. Shin guards and protective gear are not necessary, but may be worn. The winners of the local contest will compete at the Northwest District Soccer Shoot which will be held in Findlay on Saturday, June 1. The District winners will advance to the State Contest which will be held in Coshocton on July 27. The district winners who advance to the state competition will have overnight lodging provided for them and their immediate family by the Ohio Elks Association. The rain date – only in case of heavy rain or lightning – will be May 11. Van Wert, Crestview and Lincolnview each enjoyed big softball wins on Monday. KALIDA — Lauren Moore had five hits, two RBIs and scored five runs to lead Van Wert past Kalida 22-5. Adrianna Grothause chipped in with four hits, three RBIs and three runs scored, while Grace Spoor finished with three hits, four RBIs and two runs scored. As a team, the Lady Cougars finished with 19 hits, which included two each by Alexis Metz and Drew Kennedy. Moore pitched three innings and allowed four hits while fanning three. Paige Moonshower pitched the remaining two innings and gave up three hits. Van Wert enjoyed a 7-0 lead after two innings, then put up eight runs in the third. The Lady Cougars will host Kenton today. LIMA — Crestview hammered out 13 runs on 15 hits in a 13-1 win at Lima Central Catholic. The Lady Knights seized control early, leading 3-0 after the first inning and 8-0 after two.